Welcome to the Absolute Floor Sanding & Refinishing services gallery! Here you are sure to find a picture of a wood floor that looks similar to your own, whether it’s in your home or a commercial property. 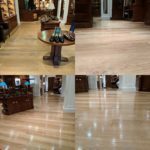 Keep looking and you’ll be sure to find a picture of how your wooden floor could look after a professional transformation completed by our expert team. All the images featured on our gallery are real pictures of real jobs our team have personally worked on, supplied here with permission from each of our satisfied customers. We take pride in our work, so we’re pleased to have this gallery available to all our prospective customers without having to use stock images taken from the internet. 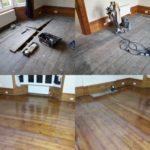 We hope you’ll find these pictures inspiring, especially when comparing the “before and after” photos which really give you an idea of what our team is capable of when it comes to wood floor sanding and refinishing services. Our selection of pictures isn’t even limited to the featured images here on our gallery page. We’re sure if you check out our Facebook, Twitter, or Instagram accounts you’ll be able to easily find a wood floor sanding project that looks similar to your own. We include pictures from before, during and after these floors have been refinished wherever we can. Fortunately we’ve worked on hundreds of successful projects so there are plenty to choose from. Whether you’re looking for an upgrade to your current wood flooring or you need someone to install a brand new one for you, look no further than the professional staff at Absolute Floor Sanding & Refinishing. If you like what you see here on our gallery page or you have any questions, please don’t hesitate to contact us and we’ll be happy to discuss your requirements and provide a highly competitive quote. Why not check out Absolute Floor Sanding's price page to get a competitive quote on all your wood floor sanding and refinishing needs. 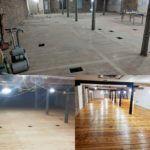 Were sure that you might find a cheaper floor sander around as there are so many have a go hero's out there, but for the price you are quoted were are sure you will not find a more professional, reliable, or better quality of wood floor sanding and refinishing in Essex, London or the surrounding area's.